Common among women of all ages, heart arrhythmia, is a condition characterized by an abnormal heart rhythm, which can include a slow, rapid, or an irregular rhythm. These heartbeat irregularities can affect the heart's ability to pump blood effectively, which, in turn, prevents the brain, lungs, and other body organs from getting enough oxygen and work properly. These disturbances cause a variety of unpleasant symptoms, but rarely signal a serious medical condition. Read on to learn more about the signs, types, and causes of heart arrhythmia, as well as how to diagnose it. 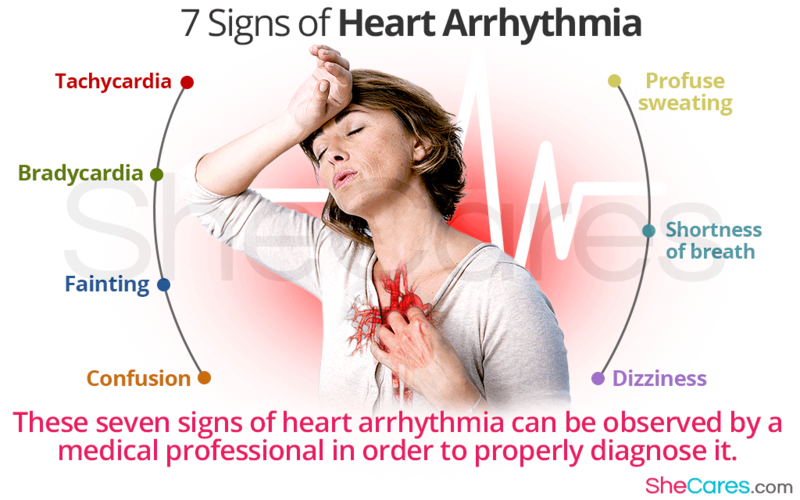 Most heart arrhythmias bring about several symptoms, such as fatigue or chest discomfort, but there are some types that do not give any obvious symptoms, and many women are not aware of any irregularities in the heart rhythm until the next doctor's visit. Heart arrhythmia has a wide range of possible causes, such as hormonal changes due to menstruation, pregnancy or menopause; medical conditions, like diabetes, heart disease, or thyroid disease; or common triggers, for example, caffeine, stress, or air pollution. Arrhythmias can be categorized in many ways, but the most classic categorization is based on the origin of irregular heart impulse or whether the arrhythmia causes a fast or a slow heart rate. Supraventricular arrhythmia originates in the atria. This type of heart arrhythmias is usually non-life-threatening. Ventricular arrhythmia includes other subtypes, such ventricular tachycardia and ventricular fibrillation. The latter is a dangerous condition, which often causes a sudden cardiac arrest and death. Tachycardia is a medical term for a fast heartbeat, defined as exceeding 100 beats per minute. Bradycardia is a medical term for a slow heartbeat, defined as less than 60 beats per minute. Diagnosing heart arrhythmia might be challenging, because the episodes of irregular heartbeat tend to come and go and last only a short while. However, standard tests include an electrocardiogram, echocardiogram, or stress test. Heart arrhythmia can be treated, depending on the underlying cause, which often involves a combination of pharmacology and alternative therapies. Occasionally heart arrhythmia has to be resolved surgically. Although it can be silent and not produce any symptoms, heart arrhythmia might still cause damage to the heart tissue and lead to various complications. Therefore, it is very important to undergo regular doctor's check-ups to take a good care of your heart.